I’ve relentlessly complained that the United States has the highest corporate tax rate among all developed nations. And if you look at all the world’s countries, our status is still very dismal. According to the the Economist, we have the second highest corporate tax rate, exceeded only by the United Arab Emirates. But some people argue that the statutory tax rate can be very misleading because of all the other policies that impact the actual tax burden on companies. It turns out that these additional variables can make a big difference in the overall attractiveness of a nation’s corporate tax regime. 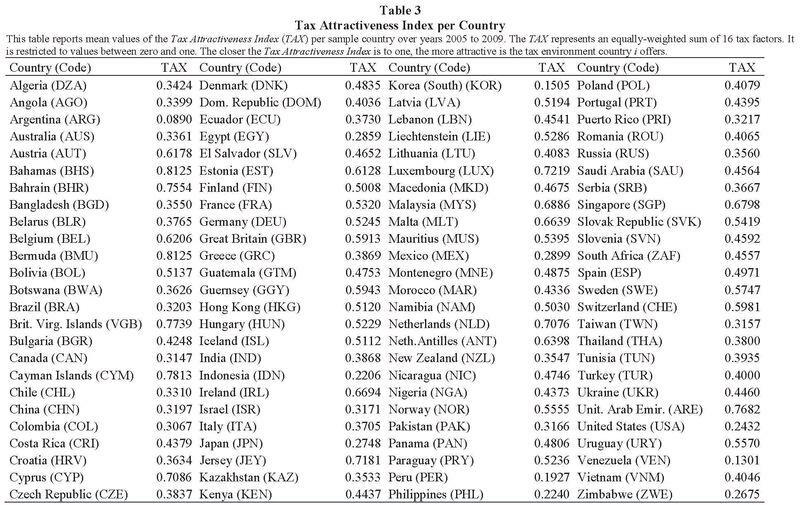 As you can see from this list of top-10 and bottom-10 nations, the United Arab Emirates has one of the world’s most attractive corporate tax systems, notwithstanding having the highest corporate tax rate. Unfortunately, the United States remains mired near the bottom. The “good news” is that we beat out Argentina and Venezuela, two of the world’s most corrupt and despotic nations. 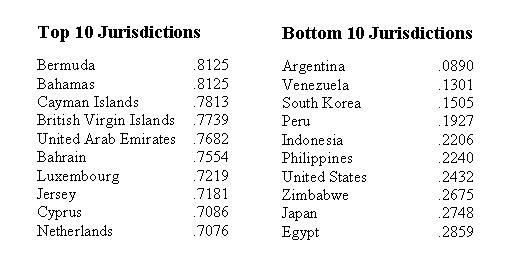 Not surprisingly, so-called tax havens dominate the top spots in the ranking. And that’s the case even though financial privacy laws are not part of the equation. Here are all the scores from the report. They listed nations in alphabetical order, so it’s not very user-friendly if you want to make comparisons. But a simple rule-of-thumb is that any score about .6000 is relatively good and any score below .4000 suggests a country is shooting itself in the foot. For what it’s worth, Switzerland and Estonia exceed the .6000 threshold, as one might expect, but I was surprised that both Hong Kong and Liechtenstein were in the middle of the pack. Heck, both nations scored worse than France! But that gives me an opportunity to issue a very important caveat. It’s good to have an attractive corporate tax system, but there are dozens of other factors that help determine a nation’s prosperity and competitiveness. Indeed, fiscal policy is only 20 percent of a country’s score in the Economic Freedom of the World rankings. So not only is it important to also look at other tax policies and the overall burden of government spending to gauge a nation’s fiscal policy, you also need to look at other big factors such as monetary policy, trade policy, and regulatory policy. As such, even though it’s galling that the American corporate tax system ranks below France (and Italy, Greece, Ukraine, Nigeria, etc), the United States fortunately does better in most other areas. That being said, I’m quite worried that we’ve dropped from 3rd place in the overall Economic Freedom of the World rankings when Bill Clinton left office to 18th place in the most recent rankings, so the trend obviously isn’t very encouraging. Another caveat to keep in mind that the rankings are for 2005-2009, so some nations will have moved up or down since then. I would be very surprised, for instance, if Cyprus was still in the top 10. And it’s quite like that the U.S. score dropped as well, thanks to the tax increases in Obamacare and the “fiscal cliff” deal. P.S. I’ve never seen a ranking of nations based solely on personal income taxes, but the Liberales Institut in Switzerland put together a “Tax Oppression Index” for industrialized nations and the United States scored 19th out of 30 nations in that measure of how individual taxpayers are treated. You cannot evaluate a entire nation based on its govermment, before qualifying a entire nation as “the world’s most corrupt and despotic” you must know it. Sounds like discriminating or prejudging. Greetings from Argentina, a good nation and strong country like our brothers and sisters Venezuelans. These indexes ignore the wide gulf between the effective tax rates of multi-nationals and domestic entrepreneurial and small business ventures. A Huffington Post article, “10 Most Profitable US Corporations Paid Average Tax Rate of 9%”, highlights the problem. Apple’s top executives were even brought before Senators, [in the US equivalent of a Russian show trial] who expressed their frustration with Apple for acting on the tax laws those very same Senators wrote. Meanwhile, small businesses cannot avail themselves of sophisticated tax avoidance practices, and get hit with those high marginal tax rates. And, we wonder why employment has slowed.